Ever dedicated to club culture, monika enterprise never fails to supply the finest remixes around. From Turner´s classic techno pop re(h)mix of Quarks or those early Contriva EPs all the way to the last years In Pieces with Pole and Burger/Voigt mixes of Gudrun Gut and lets not forget Ricardo Villalobos´ remix of Chica & The Folder; monika´s remix 12´s are a treat for any DJ and music lover. 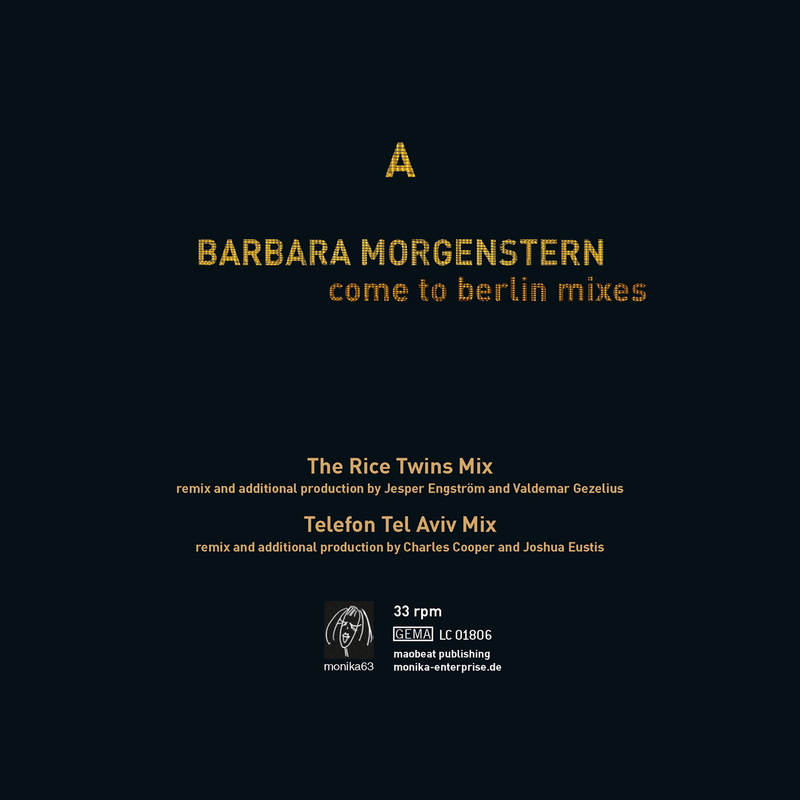 Now as a prelude to the new Barbara Morgenstern album, BM (monika64), monika brings you 3 remixes of her politically charged hit Come To Berlin including mixes by Telefon Tel Aviv, The Rice Twins and Chloé as well as an exclusive single edit. Swedish duo The Rice Twins aka Jesper Engstrom & Valdemar Gezelius are, along with The Field, part of the new generation of Skandinavian artists on the Kompakt label. There mix lifts off slowly with Barbara Morgenstern´s vocoder distorted voice and swooping melodious synth strings, gradually building up to a hypnotic crescendo. This remix continues the Cologne - Berlin connection and the musical friendship between Kompakt and monika. After all Superpitcher´s remix of Contriva is still an all time favorite. Telefon Tel Aviv are Charles Cooper and Joshua Eustis. They are on Chicago´s Hefty Records and have previously had remixes on Ghostly International, Peacefrog Records and Shitkatapult. Of all the Come To Berlin mixes Telefon Tel Aviv retain most of the original song structure, yet they still manipulate the song into a highly danceable track making it fully club compatible. French DJ Chloé has previously remixed the likes of Booka Shade and Junior Boys, and her treatment of Morgenstern´s single is a minimal cut perfect for the dancefloor. She samples the piano and vocals to great effect giving the song a fresh edge. And this terrific 12" ends with an exclusive single mix of the original song Come To Berlin just to remind you what an excellent song this is. 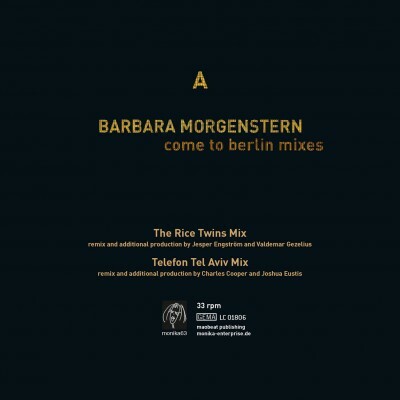 Come To Berlin is without question the poppiest song on Barbara Morgesntern´s 5th album BM. This powerful ballad is a tounge-in-cheek tribute to capital city Berlin and an anthem for tourists at the same time. Morgenstern´s music which has previously been remixed by the likes of Ellen Alien, Lawrence, Tarwater and DNTEL, lends itself impeccably to being remixed, rich and deep in complexity as it is. These 3 fabulous new remixes by The Rice Twins, Telefon Tel Aviv and Chloé make this an exceptional 12" fully in keeping with monika´s tradition for high quality remixes.